An independently produced but big-budget James Bond adventure, Never Say Never Again has Sean Connery returning for the last time to the role of Bond after a 12 year absence. He enjoys poking gentle fun at his image in an otherwise unnecessary remake of Thunderball. While at a health clinic to get back into shape, Bond (Connery) notices a nervous patient called Jack Petachi (Gavan O'Herlihy), an airforce pilot, undergoing a retinal procedure and being tended to by the luscious Fatima Blush (Barbara Carrera) a SPECTRE agent pretending to be a nurse. Bond survives an assassination attempt, then Petachi uses his fake eye to help SPECTRE steal two nuclear warheads from NATO before being killed by Blush. The plot is the brainchild of Maximillian Largo (Klaus Maria Brandauer), a senior SPECTRE operative who now wants to blackmail the world. 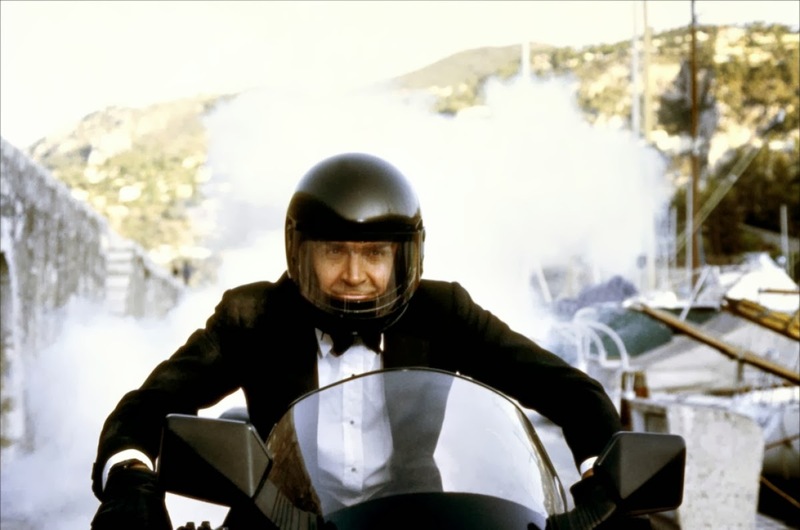 Bond tracks down Largo to a yacht in the Bahamas, where he meets Domino Petachi (Kim Basinger), held by Largo as a combination hostage and lover, and as a lever to control her brother Jack. Bond and Largo duel over an elaborate video game, then Bond attempts to turn Domino into an ally by informing her of her brother's death. After a stop in Nice where Bond tangles with Blush, Bond has to try and rescue Domino while stopping Largo from proceeding with plans to bury one of the warheads below the oilfields of the Middle East. Co-produced by Kevin McClory as part of his long-running claim to elements of Ian Fleming's Thunderball story, Never Say Never Again enjoys a reasonably brisk opening 45 minutes. Connery quickly gets back into the groove, not shying away from plenty of comments about his age, and criticisms about his abilities from M (Edward Fox). At 53 years old Connery looks passably fit and reasonably believable as a secret agent, and he brings enough intensity and his trademark confidence to generate satisfactory dynamism. The scenes at the health clinic, the video duel with Largo, and the tango dance with Domino are sharply executed and classy, and carry enough of a dangerous edge to build up adequate momentum. But the film then stalls quite noticeably, with the second half drifting into slow moving non-event. Largo's yacht seems to take forever to reach its final destination. A detour to an encounter with Arab slave traders proves to be a perfunctory excuse to tie a half-dressed Domino to the stake and surround her with medieval tribesmen foaming at the mouth, as a hackneyed set-up for an unconvincing rescue. Rowan Atkinson does not help matters with a comic relief appearance as a Foreign Office representative in the Bahamas, neither do ridiculous remote-controlled live sharks. Only a motorcycle chase between Bond and Fatima Blush livens things up, the maniacal assassin proving to be a colourful and demented adversary. Barbara Carrera has plenty of fun in the role, her wild costumes and supreme self-confidence creating a combustible combination. In contrast, Basinger is given next to nothing to do, her early dance with Connery the only highlight as she gradually disappears into a passive non-entity. Her late commitment to avenge her brother's death is unconvincing. Brandauer gets plenty of screentime but is nevertheless one of the less memorable Bond villains, while Max Von Sydow appears briefly as a Blofeld. Director Irvin Kershner sleepily steers the action towards a limp climax, a shoot-out in an underwater cave where Largo's men are clumsily attempting to place the warhead just so, giving Bond and the CIA's Felix Leiter (Bernie Casey) plenty of time to mount an offensive. Never Say Never Again uncovers just enough of the old Connery magic to justify the effort, but although never is a long time, even he can now say enough is enough.